We’ve all thought about it… the day when super-intelligent computer becomes self-aware and unleashes a nuclear holocaust, followed shortly thereafter by the rise of the machines (cue theme from Terminator). But as it turns out, when the robot army does come to exterminate humanity, at two humans might be safe – Google co-founders Larry Page and Sergey Brin to be precise. Basically, they’ve uploaded a killer-robots.txt file to their servers that instructs T-800 and T-1000 Terminators to spare the company’s co-founders (or “disallow” their deaths). 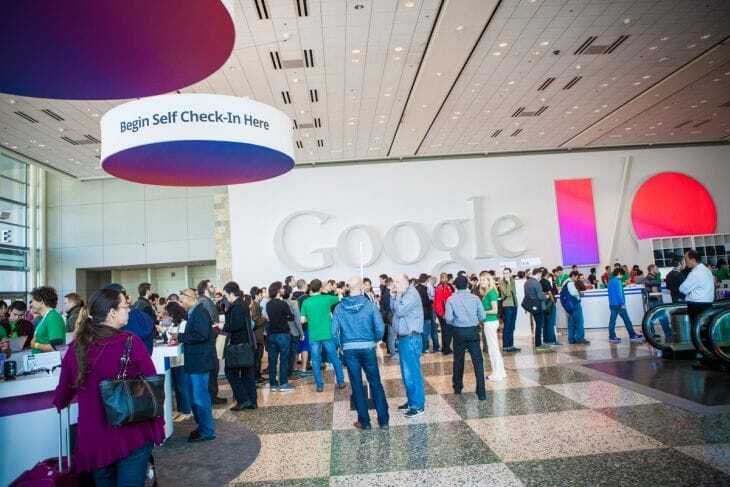 Such was the subject of a totally tongue-in-cheek presentation at this year’s Google I/O at the Moscone Center in San Fransisco, which coincided with the 20th anniversary of the Robots.txt file. While that tool didn’t exactly take the rise of the machines into account, it’s appearance on the Google’s website as an Easter egg did add some levity to a company that is already being accused of facilitating in the creation of killer robots. 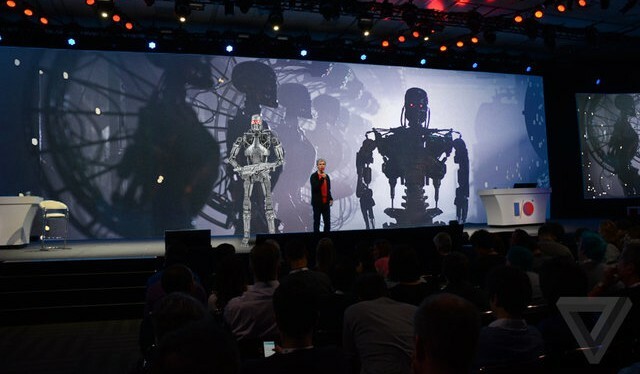 Calling Google’s proposed line or robots “killer” does seem both premature and extreme, that did not stop a protester from interrupting the I/O 2014 keynote address. Basically, as Google’s senior VP of technical infrastructure Urs Hölze spoke about their cloud platform, the unidentified man stood up and began screaming “You all work for a totalitarian company that builds machines that kill people!” As you can see from the video below, Hölze did his best to take the interruptions in stride and continued with the presentation. The protestor was later escorted out by security. This wasn’t the first time that Google has been the source of controversy over the prospect of building “killer robots”. Ever since Google acquired Boston Dynamics and seven other robots companies in the space of six months (between and June and Dec of 2013), there has been some fear that the company has a killer machine in the works that it will attempt to sell to the armed forces. Naturally, this is all part of a general sense of anxiety that surrounds developments being made across multiple fields. Whereas some concerns have crystallized into dedicated and intelligent calls for banning autonomous killer machines in advance – aka. 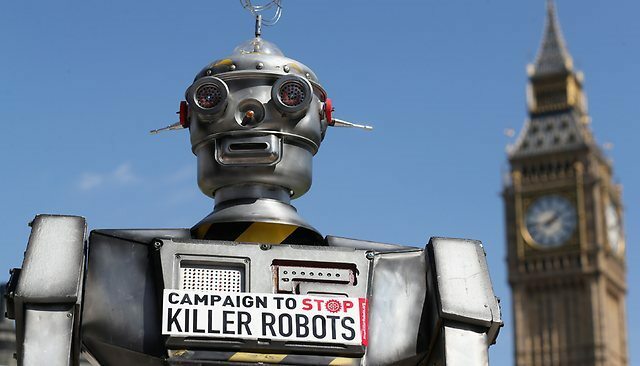 the Campaign To Stop Killer Robots – others have resulted in the kinds of irrational outbreaks observed at this year’s I/O. Needless to say, if Google does begin developing killer robots, or just starts militarizing its line of Boston Dynamics acquisitions, we can expect that just about everyone who can access (or hack their way into) the Robots.txt file to be adding their names. And it might not be too soon to update the list to include the T-X, Replicants, and any other killer robots we can think of! Just them? Good luck getting the human race to survive with just those two around. Like I said, we better learn how to hack that file. Or invest in some EMPs. Or we will be deleted! Delete! Delete! Delete!